A flurry of texts were sent out mid week. 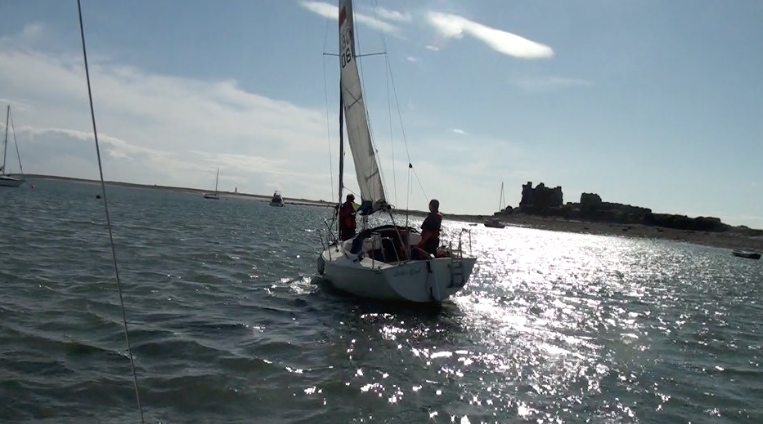 The usual sailors were up for an over night cruise to Piel. The weather was generally dull and uninspiring, where the wind didn’t blow hard enough to sail until the final hours on Sunday afternoon. A guest sailor from Leigh & Lowton Sailing Club crewed on Jamila. A good weekend was had all by all. Piel – Glasson Dock – Piel, an all together different perspective. Some times its great to see the familiar things we love and cherish from an altogether different perspective. Wardley’s sailors love the cut and thrust of sailing in and out of the tidal waters of the Wyre Estuary and Morecambe Bay. More often or not he is happy weekend after weekend to thumb through his little blue tide booklet, bang out a cunning tidal-curve, and finally gamble on just how late he can leave it cutting across any sandbanks lying between Morecambe Bay’s choppy seas and a good pint at the Ship Inn. This quirky Wardley Marine Yacht Club art form was taken to its extreme recently by the magnificent skipper of REXY who amazingly made it safely home after a cracking trip back from the Ship Inn, going aground only ten yards short of his mooring buoy. It occurred to Andy and Simon, as they discussed the possibility of an extended three day cruise, that maybe they should try and do things a little differently this time. The pre-sail-planning wasn’t going to be by any means a walk in the park! The moon was out of alignment with the two other significant ‘planets’ in the Wardley-sailor’s life, namely the sun and the earth. Neap tides were upon us, and so the old tidal curve sums were going to count more than ever. The plan was to go Piel-Glasson-Piel. The various problems discussed on a telephone line between Rawtenstall and Rochdale were as follows. Could they assemble their kit and make it out to Jamila without losing something or capsizing? The measly neap tide was barely going to make it to the end of the slipway, could they safely get on the dinghy without slipping over and getting mud everywhere? After unloading the dinghy into Jamila’s cockpit, could they get the boat ready before the river Wyre empties into the sea? If they are late arriving at Piel, would there be any moorings left? Would the harbour master open the gate at Glasson Dock and would it open twelve hours later to let them out? And most importantly, given the tides on the third and final day were forecast as the lowest of them all, would they make it home back up the river Wyre? Nevertheless, a decision was taken. It was in the best of Wardley’s tradition: let’s give it a go! Friendly Wardley’s Sailors milling about on the hard. The two sailors arrived by car and as always there were friendly club members to chat with. A natter with Vic ensued where certain matters pertaining to the club were chewed over. Also, Darren’s car could be seen on the hard but with no Darren in evidence. They guessed that he must be napping on his boat following a long shift at work. It would not be fair to disturb him! Getting all the kit down the slipway was going to be tricky. Slippery mud covered the last four yards to the water. They did not want to bring mud on the boat. An idea was formulated to do things slightly differently. A plan to man handle the dinghy down the ladders and across the work boat was put into action. It worked well! The dinghy was deposited into the water. All the kit plus 25 litres of diesel in multiple cans took the same route. Eventually the two sailors, in cramped conditions, legs at awkward angles paddled out to Jamila patiently awaiting them on her mooring. The clock was ticking. The river Wyre was soon going to empty itself leaving a mere trickle. Aboard Jamila with all the kit pushed into the cockpit it was a fight to get into the cabin. Arms, legs, diesel cans, loafs of bread, and more were everywhere. Still, they manage to packed it all away in double quick time. By now, the boat had swung down stream, which was a sure sign that tide had turned. There were still things to do, the bilges had to be pumped, the electrics powered up, and a check list of things to do before starting the engine had to be followed. The engine burst into life first go. Jamila slipped her mooring slightly behind schedule but still with a better than fair chance of making it down river. They made it to Knott End with out problem but both sailors couldn’t help but watch the depth sounder closely and, at times, look anxiously at each other. Racing down the Wyre before the water ebbs. It was an amazing sail across the bay. The sailing got better and better as time went on. They even managed to prepare and eat a delicious vegetable curry on the go, which was necessary since it would be too late for a meal at the Ship Inn. Eventually they sailed into the inner channel passing Haws Point East tower (affectionally known as Norman’s Perch), and finally turned to port at East Scar buoy into Bass Pool. By this time the sun was getting very low in the sky. They zig zagged into Bass Pool carefully noting the depths. At a calculated 1.5 metres under the keel at low water the anchor was dropped. They were still tidying the decks, coiling ropes, and packing away the sails when the sun finally slipped below the horizon. Without wasting time they both jumped into the Avon and rowed ashore. Initially, the walk up the foreshore was over soft sand and mussel beds, but not quite soft enough for boots to sink in and pull off. Soon they were on to large pebbles. There were big boulders everywhere. Some would be dangerously awash when the tide returns. It was important at that moment, whilst negotiating the larger pebbles, not to turn an ankle and get to the grassy banks below the castle in one piece. Soon they were walking across the castle’s outer keep, heading towards the Ship Inn just beyond. There were tents dotted all around, and some of the campers were showing off fashionable looking LED lights and barbecuing setups. Dropping anchor in Bass Pool. The ship Inn was busy. It was a karaoke night. A number of drinkers put on some accomplish performances. The regular crowd of sailors and fisherman were as usual propping up the far end of the bar. The story of a recent five boat tour of Isle of Man and Western Isles of Scotland was being told. Apparently the cruise could not have been better, they all concluded that they had as good as won the lottery with the weather. Eventually after several hours or so Sheila rang the bell for last orders . Some of the younger drinkers looked at each other a little puzzled. The more weather beaten looking sailors could easily read the expression writ large on the landlady’s face: “Right you lot, drink-up, I want you all out in half an hour so I can clear up and go to bed!” Eventually everyone tumbled out of the pub just after midnight. The two sailors picked their way through the rising meadow towards the campsite. They tried not to trip over the many guy lines that lay in wait. Eventually, they threaded their way passed an inky black castle set against a star blazoned sky. Coastal lights swept the horizon from Morecambe to Blackpool. They stumbled down onto the beach and disturbed a young couple sharing a sleeping bag enjoying a night under the stars. Apologies were made and humorously accepted. They re-entered the boulder strewn foreshore of Piel Scar. Black shapes were all around. They stumbled on. They questioned themselves: where’s the dinghy, did we come the same way back, have we walked too far, what’s that larger squat looking boulder lying fifty yards square on the left. They headed towards it. As the distance closed, the watery light emitted from their head torches revealed not a boulder but a shiny damp dinghy, almost appearing to glow-in-the-dark. Strangely the Avon round-tail dinghy looked like new under the ghostly LED light that shone upon it! Soon the two Wardleys sailors were transiting the water between the shoreline and what, at that moment, appeared to be a dim shape out in the dark. It was a moonless sky. The countless millions of stars, as magnificent as they were, were even less capable at illuminating things than the torches. However, after twenty or thirty quick sharp oar strokes the small distance covered was enough to bring the shape of a Mirage 2700 into focus. It grew larger and larger, eventually overwhelming the darkness, and for some strange reason, maybe the alcohol consumed in the Ship Inn, one of the sailors at least thought Jamila’s mast seemed taller than ever, seemingly reaching right up into the stars themselves. After a quick check that Jamila’s position had not changed and that the anchor was holding good the two sailors retired for a well earned nights sleep. And so it was, Jamila spent a restful night tucked away from the world’s worries anchored in Bass Pool by the much loved Piel Island’s south side. Andy heading for the dinghy. Jamila awaits at anchor on the south side of the castle in Bass Pool. The following morning, a scrumptious breakfast was enjoyed at the Ship Inn whilst looking out over Morecambe Bay in perfect blue sky weather. This time, one of King Steve’s small English breakfasts and a cup of tea proved quite enough. Ten litres of fresh drinking water was taken from the camper’s ablutions block and carried back over the island to Bass Pool. Along the way, a few friendly nods were exchanged with bleary eye but happy looking campers emerging from their tents. Rather than the previous landing in the midst of the boulders on Piel Scar, the dinghy was this time retrieved from the sandy shoreline further to the west. Yes, a little further to row for the two Wardley’s sailors, but a much more amenable landing location away from the large pebbles and boulders. Andy and Simon take a pause for a selfie on the way to Walney Light House. At the beginning of this narrative, it was said that an aim during this trip was to see the familiar from a different perspective. Anchoring in Bass Pool as opposed to picking up a buoy was the first great step in this regard. The views seemed broader and wider. The castle with its outer wall looked more striking. 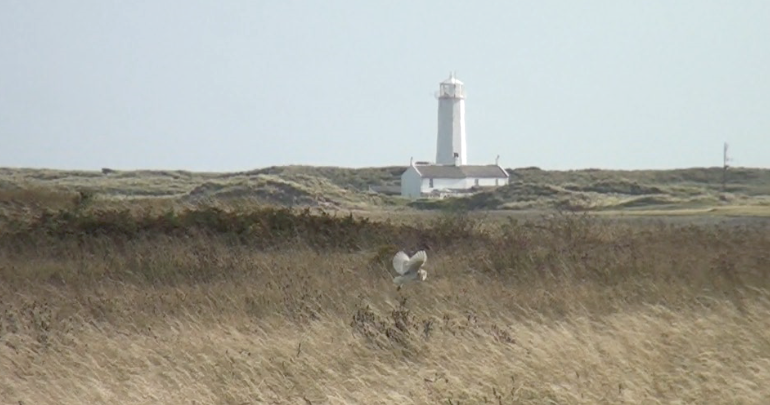 The lighthouse on Walney Island was closer and more prominent. At low tide ‘Bass Pool’ gives an esthetically pleasing open expanse feel similar to that of a mere on the Norfolk Broads, being surrounded on all sides by big skies. But there was better to come. Just across the way was Walney Island. Surprisingly, neither sailor had stepped foot on the largest of the Furness Peninsular islands before. Low tide had brought the sand of Walney within spitting distance of Jamila. A short hop in the Avon-round-tail was all that was required to open a new chapter in discovery. The Walney Island turned out to be amazing. It felt like a links golf course that had been allowed to return to the wild. It had a swarthy but fresh and welcoming feel about it. A rough road running a long side a deep green grass covered flood plain led to a tall white painted light house with an adjoining keepers house, which as been since converted into a family home. There were several wild life hides dotted around. As the two sailors ambled past them, they appeared very quiet and unoccupied, or so they thought? Finally they reached a magnificent beach on the far side where the sea stretches out across Morecambe Bay to Blackpool tower and beyond. Looking back the way they came, masts and sails protruding above the grassy landscape were observed working there way across the low country side. 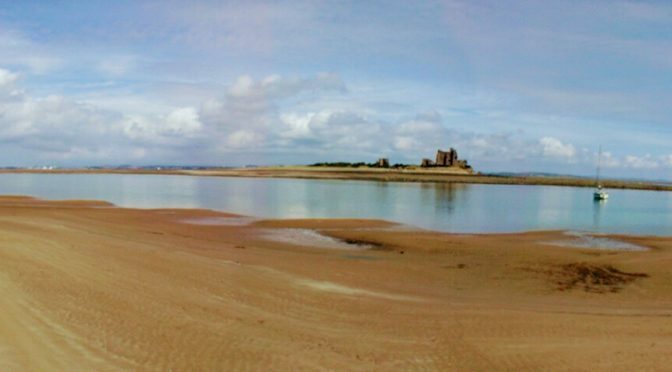 Andy S. looks back at Piel castle across the ponds on Walney Island. In reality they were sailboats navigating the Barrow channel heading for the open sea. Yet again the two sailor were see things from a new perspective. It was an artist’s paradise! Andy painfully regretted not having brought his posh camera, which at that moment was sitting uselessly at home in Rochdale. Their smart phone cameras would therefore have to make do! Walney Light House up close. The closest these particular sailors have been. Once back on Jamila it was time to clear the decks and to hoist the sails for the next leg and perhaps the most interesting part of the planned journey. They were preparing to sail back to the Lancashire coast, but instead of the ‘Fairway Buoy’ their next waypoint was to be the ‘Lune No1 Buoy several miles further to the north’. The final destination was the port of Glasson-Dock. Plover Scar beacon marking the entrance to the river Lune. The main channel into Glasson-Dock is surrounded by deep sand banks that are just and so covered at high water. The very prominent Plover Scar beacon stationed not far offshore marks an out-crop of flat rock commonly known in the area as ‘scars’ where care must be taken. If any part of this cruise could rip the keel or rudder off an approaching Wardley’s yacht, carried along a little too fast by an incoming tide, it would be Plover Scar! Jamila in the outer basin at Glasson Dock. The Dalton Arms is across the way just to the left of the gabled-end building. The lateral marker buoys into Lancaster are few and far between compared with other places but Andy’s sharp eyes were able to pick them out one by one. 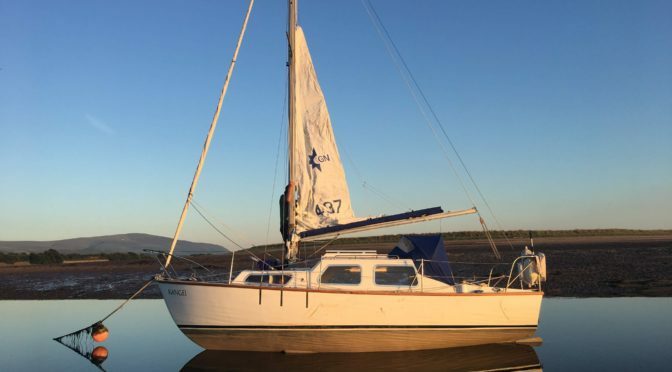 With careful pilotage the two Wardley’s sailors kept Jamila’s keel clear of the bottom, passing Sunderland Point to starboard and finally arriving outside the entrance gate at Glasson Dock. The entry light was on red, but the two sailors could see the tidal gate was slowly sinking down, soon to slip under the water, into its open position. Soon enough, the entry light turned to green signalling to the two sailors to advance over the threshold, which they did and then went on to tie up, as instructed by the harbour master, along side a pilot boat called ‘Trelawney’. Fifteen minutes later they were on dry land, had handed over a small fee to the authorities and were supping a pint of ale in a dock side pub called ‘The Dalton Arms’. The stay at Glasson was short. The ‘Silver River’ coaster was due in at 06:00 hours. Bob the harbour master wanted the two Wardley’s sailors out before the big boat arrived on the high tide. The gate was opened a little sooner than usual. Everything was going to plan until Jamila went aground just before the gate. This cost vital minutes. Bob shouted from the quayside that they should try again but take a line further to port. Jamila went astern for another attempt. It worked except as they passed the tidal gate the ‘Silver River’ came in spinning around, still being carried by the flood tide. The exit out to sea was now block by five hundred tonnes of moving steel. Jamila was once again forced to go hard astern. For a moment they were faced with a large churning propeller forcing chunks of the river lune onto a rusty rudder as the big boat struggle to complete a full turn in front of the tidal gate. Silver River’s aim was the North wall just outside the gate where she is able to take the ground at low tide. All this action was happening on an overcast Monday morning. The plan for the day was to leave Glasson on the early tide, sail to Piel, have lunch at the Ship Inn, and finally return to Wardley’s Creek on the following high water. After hovering for a minute or two by the gate, where Bob the harbour master was standing tall commanding operations on the quayside, a gap opened up through which Jamila made a courageous dash for open water. The weather forecast was cited as force four to five. As Jamila passed the ancient quay side dwellings of Sunderland Point, home to a few hundred Lancastrians whose single approaching road is famously cut off at high water, a decision was taken to hoist the sails with a number one reef in the main. The wind was mainly on the nose leaving Lancaster. Neither of the Wardley’s sailors had much experience of sailing in this neck of the woods so it was decided to remain under engine until arriving at the Lune No. 4 buoy. At that point the Jamila’s skipper had calculated a feasible close hauled course over the ‘Sunderland Shoulder’ sand bank (drying 5m above at low water) which would give at least a metre under the keel if their tidal curve calculations were correct, and would take them with a knot and a half of out going tide, in the direction of Piel Island. By this time the overcast sky was being replaced by blue sky and fluffy white clouds coming in from the west. With a reef in the main and a balancing portion of genoa was unfurled, Jamila’s engine was cut and a port-tack heading in the direction of ‘ Humphry Head’ was struck. Jamila’s sails filled and stiffened, she healed to the wind, her starboard gunwale buried itself into the on coming sea and soon the depth gauge shot up to three meters of depth as she advanced over the said ‘Sunderland Shoulder’ sandbank towards the Heysham deeps. The three hour sail over to Piel was one of those classic sails that all sailors idealize about in the off season whilst thumbing through additions of the Practical Boat Owner, or watching episodes of Dylan Winter on YouTube. 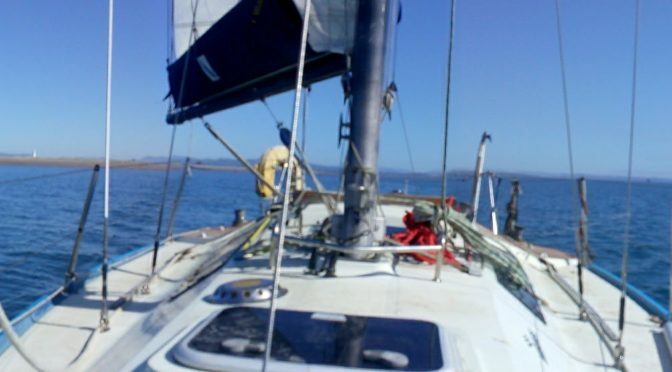 It was all blissful sunshine, blue seas, white canvas filled with wind, and a sparkling frothy trail left astern. Eventually the depth increased dramatically as Jamila cross into the Heysham deeps. After an hour of tough close-hauled sailing, both sailors looked at each other quizzically and were agreed that the view looking towards our destination looked somewhat peculiar. The castle was way to the left and the Barrow docks well to the right. This is NOT how it looks coming out of the River Wyre! Why hadn’t the tide taken them further to the south? What a fantastic summer we were having. So much sun and fair weather. Jamila’s position was plotted on the chart. It was then compared again the estimated positions planned a few hours earlier. This revealed that she was much higher up into Morecambe Bay than expected. The estimate of a one and a half knot current sweeping them south had been an over estimation, and no offset for leeway had been factored in, which all in all had contributed to the current situation. Luckily, during the course of the morning, the wind had backed-off to the south and the Wardley’s sailors were able to make the necessary course correction without the need for a starboard tack. Nevertheless it was going to be a seat of the pants ride over shallow waters and drying sandbanks until ‘Haws Point East’. Harking back to the premise of this post, yes it is certainly invigorating to see the ‘familiar, from a different perspective! The lunch at Piel turned out to be a non event. Steve and Sheila had just arrived back, in two rusty 4x4s packed full of previsions. There was a sense of mild disarray on the Island. Again, the different perspective thingy again, it was a Monday not the weekend when everything runs like a swiss watch. With regard to getting some lunch, King Steve gave them a mooted version of the answer they were looking for, however, the look on Queen Shelia’s face when the two sailors made further enquiries told them in no uncertain terms that they weren’t going to be sat over-looking Morecambe Bay with a pub lunch any time soon. The two Wardley’s sailor beat a retreat back over the island, passing the castle and the few remaining tents, back to Bass Pool where Jamila lay awaiting at anchor. A lunch of sorts was rustled up from the left-over provisions on board. It wasn’t bad impromptu cuisine, but alas no good honest PIel Island draft ales or the like were consumed that lunch time. The wind was dropping. By the time the boat slipped her anchorage the tide had been on the flood for an hour. The engine was required to get out of the channel. Once back at Haws Point the engine was cut and a course set for home. Three knots was the best the boat would do. Unfortunately this was not enough. One of the big questions arising out of this trip was still to be answered, would Jamila get back to her mooring without running aground? The sailors looked at each other and almost without having to touch anything the engine burst back into life. There was a moment of respite found from the monotonous throbbing however. Once the boat had passed the Fairway Buoy the tide veered in towards the river Wyre. This dramatic ninety turn in direction starts nearly a mile out. Suddenly Jamila was quite literally going with the flow; the wind and tide was running together! Fantastic, the last couple of miles were completed under sail alone. Once back in the river. A cunning plan was put into action. It was neap tides. The best they could expect was seven and a half metres of water in the river. This was touch and go territory. To the rescue, Andy had a trump card tucked up his sleeve that would help them up the river. They had a small iBook tablet. On it was chart plotting software giving the latest depth survey sounding of the Wyre’s upper reaches. Equally important, it would tell them the exact location of Jamila with respect to the multitude of depth numbers shown on the little screen. Back up the Wyre passing the chemical works. Needless to say, the two sailors made it back to the mooring. Still, at times there was very little margin for error. 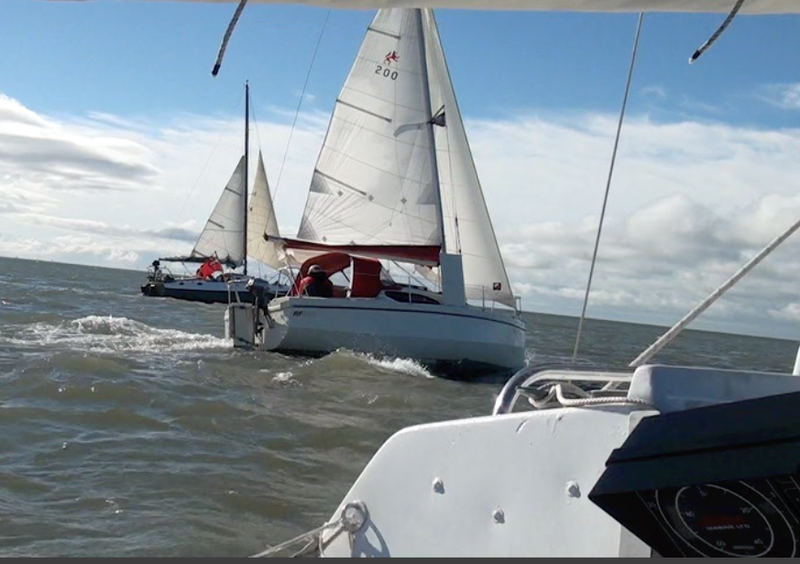 Some aggressive turns to port and starboard were required to keep to the optimal line. At one point there was only half a meter under the keel. Momentarily the boat crossed a deep pool marked at 0.5 surrounded by 4s and 5s. As predicted, Jamila’s depth sounder shot up very briefly to 7 metres. Once passed the chemical plant the remaining leg was straight forward with little to go wrong. The club house was very quiet when they returned. A bye stander would have observed two tired but contented looking sailors finally disembark from an Avon round-tail dinghy, and at a plodding pace, haul their kit and belongings up the concrete slipway. It was around seven thirty in the evening. There was a relaxed sultry feel in the air. All that remained was to pack-up, put the kit in the car and go home. What an amazing three days. Jamila takes a well earned rest. In early April an assortment of Wardleys sailors crowded around a small map on the club house notice board and chattered excitedly amongst themselves. The map showed a large bay facing the north-east with a thin strip of land separating it from yet another bay of equal size on the opposite side. To the east of these conjoined bays was a thin strip of land, containing a golf-course, jutting out into the Irish sea. Tom, one of the club’s experienced sea-sailors, clutching a large mug of tea, suggested that this would be the ideal place for a ‘Wardleys flotilla’ to rendezvous, after setting out from the tidal channels of Morecambe Bay. 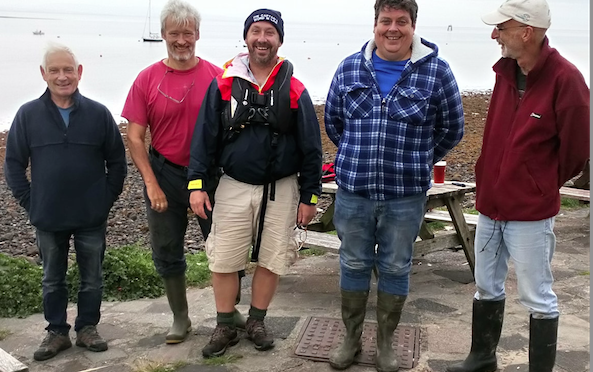 Five Wardleys’ skippers declared they were up for the challenge! Morecambe Bay to the Isle of Man. A very long day 12 hour sail. 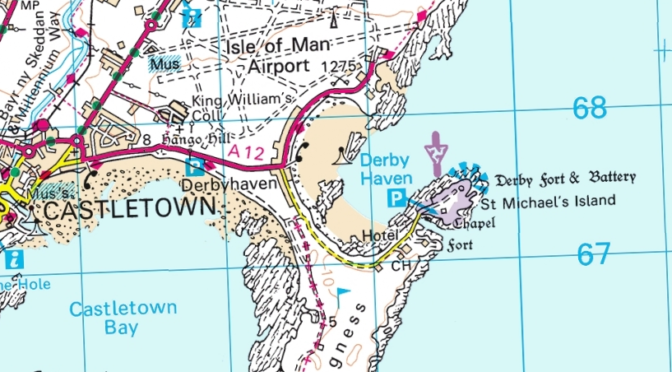 Any anchorage had to be well sheltered from the prevailing south-westerlies, and not-least be somewhere on IOM, so a quick straw vote was taken and ‘DERBY HAVEN’ bay it was to be. Derby Heven Bay in the south east of the Isle of Man. Five intrepid Wardley’s sailor on four boats sailed into this bay in the month of May 2018. Well, as we all know, great plans are easier to make than to realize. Beers in the club house, a good bit of banter alloyed with collective desire for adventure can easily give birth to plans, but somewhere between making and executing plans things can happen. But hey-ho, a month later two Wardleys boats and three members found themselves sailing with the ebb down the river Wyre, stocked up with provisions, diesel, and sails aloft. Simon was on ‘Jamila’ and Darren and Phil on ‘Rivendell’. The plan was to complete the outward bound cruise in two legs. First to head over to Piel — not that far in the scheme of things — get an early dinner, drink a pint or two, and be sleeping by ten o’clock so ready for a half-past three morning departure. The other skippers in the planned cruise, Nick, Malcolm and Tom, all hoped break their shackles and rendezvous later on in the week. For ‘Rivendell’ and ‘Jamila’, the first leg went pretty much according to plan. The two Wardleys boats arrived at Piel in unadulterated sunshine. The scene was the classic ‘summer holiday’. Crowds of tourists, sailors and campers milled around the Ship Inn. Children were crabbing in the shallows. 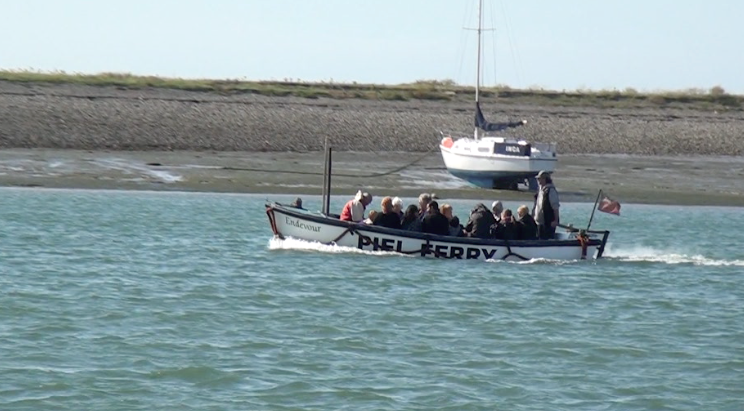 The Piel ferry was at the slipway full of punters with happy smiles, climbing on and off over the gunwales. Up on the island by the Ship Inn the sounds of joking and laughter, mothers calling children, and dogs barking, all came floating down over the water as far as the two Wardley’s boats now sat at anchor. The three sailors decided to wait an hour for the hustle and bustle to clear, then launch the dinghy, go ashore, dine quietly in the Ship, then retire early in preparation for the early start. In fact, all three sailor fell asleep for a short while! The three sailors packed tightly into Rivendell’s small dinghy to go ashore. As they rowed towards the long pier they could just and so hear, over the rhythmic creaky clattering of the oars, the faint sound of the ‘put, put, put’ sound from the last Piel Ferry heading into the distance depositing the last of the Island visitors on the main land. A disappointment was awaiting the three sailors! A rather forlorn walk around the island ensued. The evening was idyllic, the views over Morecambe Bay were magnificent but there was a sense of loss and disappointment in the air. Walk around the island. The sailor were hungry Only the owl was dining that night on the island. The Wardleys sailors retired back to the boats and set about choosing a route over to ‘Derbyhaven Bay’. 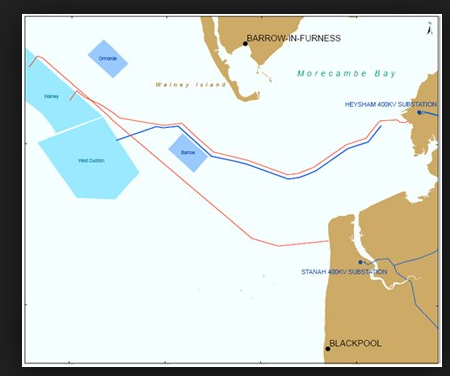 After some discussion, a decision was taken on which way to go around the huge wind farm just off Walney Island. One route looked marginally better for the tides, the other route looked better for the winds. A priority was set on sailing and so they selected the southern-route and maybe make a small saving in diesel along the way. The march of time never stops, dates, deadlines and everything else in life sooner-or-later comes along whether you want it or not. Morning wake-up alarms rang on both boats at half-past three. Luckily, ‘Rivendell’ crew member Phil, a good solid early riser, was on hand to ensured that his skipper ‘Darren’, who’s solidity here is highly questionable, was up and ready by four o’clock, the allotted time for departure. Simon on ‘Jamila’ also made it out of his bunk, and both boats quietly slipped anchor as scheduled. The sun was still more than six degrees below the horizon, just behind the seaside resort of Morecambe, thus the sky was still a dark shade of black. An early morning dog walker, looking out to sea, would have witnessed the dimly lit sails of two vessels quietly tacking down the Barrow channel out into nothingness. The first part of the long road to IOM was easy, the helmsman maintains a steady path between the red and green channel lights until reaching the ‘Lighting Knoll’ buoy. This last is the main cardinal that marks the start of deep water ahead. During this first leg the sun, still hidden below the horizon, entered the sub six degree sector and the sky started to lighten dramatically. The far-distant shore lights that could be seen all around started to disappear one-by-one and were replaced by thin faint strips of coastline. By the time the two boats arrived at the ‘Lightning Knoll’ buoy a magnificent sunrise over the Northwest coast of England took place. Now…, without doubt, there is no better place to witness this thrilling moment than out at sea. Sun rise over Morecambe Bay. ‘Rivendell’ making way. Click image to see in full detail. Over to the west and through the semi daylight gloom a forest of wind-generators started to appear. The first ‘wind-mills’ people see from the shore are just a small farm twenty to thirty strong, but behind those, are three much larger farms that reach-out deep into the Irish sea. Here there are hundreds of them! During this decision making process, the skipper of ‘Jamila’ was looking at the big arrow on his GPS. It was pointing confidently across the Irish Sea towards Derby Haven bay some 50 miles distance. Quite suddenly a corridor opened up in the grid type arrangement of generators and the said GPS arrow was pointing straight down the middle. The corridor looked clearly defined as far as the eye could see, help by the closed-up elignment of the towers on each flank. In an instant Jamila’s tiller was pushed hard to port, her sheets were slackened, her sails allowed to billow, and away she went diving directly into the vast mechanical forest. Jamila changes course and dives into the forest of wind generators. Phil on ‘Rivendell’ with first field of generators (closest to Walney) to starboard. The photo illustrates nicely now the towers line up in a grid pattern. The skipper of ‘Rivendel’ decided to stick to the original plan and head for the GPS way-points that had been discussed the night before on Piel Island. This meant a couple more hours of arduous motor-sailing into the wind and tide in order to skirt the southern edge of the wind-farms. This wasn’t really a problem though, for ‘Rivendell’ is a Mirage 2700 equipped with a powerful diesel, and with her big blue spray hood pulled up, she makes a comfortable motorboat when the conditions require. ‘Rivendel’s dividend was paid in FULL two or three hours later. 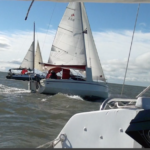 By then she had passed the planned GPS way-point, she was well to the south of the wind farm, she was able to change course to west-north-west bringing the wind onto the beam thus providing the optimum angle of attack, but most importantly, the tide had turned in her favour. All the key parameters had come into alignment. Now, it was full speed ahead for Derbyhaven Bay. But things got even better! Suddenly ‘Rivendell’ wasn’t alone, but surrounded by dolphins. A whole pod of them for a period of thirty-minutes headed in the same direction. It is often said that this particular experience can stir and prick the emotions of the hardiest mariners, Daren and Phil can confirm this! A dolphin off the starboard bow. Further to the north ‘Jamila’ was struggling! Advancing beyond the the wind-farms seemed like a losing battle. The south-westerly force-four winds didn’t really materialize as promised. For far too long she was surrounded by them and they just wouldn’t go away. This was largely due to plugging a flood tide still heading towards Morecambe Bay. And in addition, it was all too easy to get complacent whilst relying on the tiller pilot. On more than one occasion the skipper set a course down a corridor of towers only to find, when emerging from the cabin after say doing a spot of chart-work, a blooming great tower reaching high out of the sea, well above the mast and sails, and only yards distance. Along way up to get to the ground floor! The bottom of the blade still high above Jamila’s mast top. The hours passed by. Then three positive events came into conjunction. The tide turned, the wind increased, and Jamila had finally passed the last of the wind-farm generators. Until this point there was still two-thirds of the total distance to sail and four hours had passed by. The GPS was predicting a ETA of eleven o’clock in the evening. It was not a very nice thought, arriving in a strange location late at night in the pitch-black, dropping a hook and hoping for a good night’s sleep. 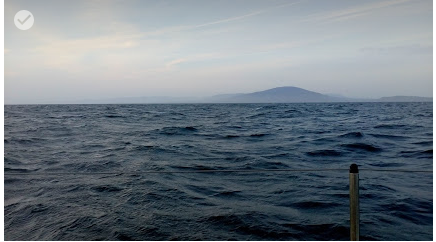 Four more hours passed, during which time Jamila steadily creamed across the Irish Sea, the sky was blue, her white sails pressed hard, and the water around her turned a deeper blue with the odd white crest here and there as the wind steadily increased. Nothing much changed visually until you look behind and traced your eye back along Jamila’s foaming wake to where the wind-farm had been, for now it was but a thin strip of gleaming pins just visible on the horizon. More time passed and still no sign of anything. Its often when you stop straining your eyes looking for something that the something in question comes into sight. Shrouded in mist that is often the case for the Isle of Man the land became visible. Amazing when the Skipper next looked at his GPS the ETA had reduced to seven o’clock in the evening. The combination of the increase in speed and an ebbing tide carrying the boat directly toward ‘Derbyhaven Bay’ had been astonishingly beneficial. The pubs might be still open! In the meantime Daren and Phil on ‘Rivendell’ were taking the more southerly route around the farms. With the wind more or less on the nose she had gunned past the wind-farms under engine and made much better time. By the time the favourable beam wind had arrived, she was more than an hour ahead, and had disappeared out of sight of ‘Jamila’. In the end both boats arrived safely and dropped their anchors, still in bright daylight. Derbyhaven Bay looking north west towards the aerodrome. Derbyhaven Bay looking southwest towards Derbyhaven port. As it happen, visits to pubs was far from what the Wardleys’ sailors really desired. What they all really really wanted was sleep and lots of it! View of Derbyhaven from Langness. 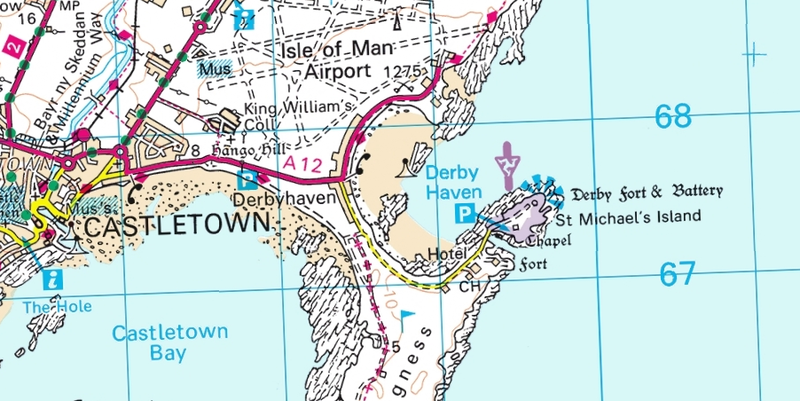 The delights of Derbyhaven, and Castletown just beyond, would be checked-out in the morning. As for the other Wardleys sailors who had been huddled around the club notice board back in April, Nick arrived a day or two later, Malcolm arrived a week later, and Tom’s dreams of a late May IOM adventure were spoilt by unexpected commitments.